Medicago truncatula is an annual plant used for studying legume biology, in particular symbioses with nitrogen-fixing rhizobia and arbuscular mycorrhizal fungi. Efforts to decipher the genetic basis of these ecologically and economically important traits are a major goal of plant and crop biology. 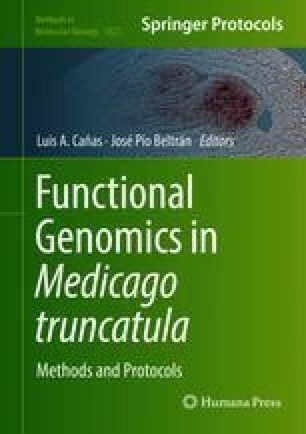 M. truncatula is an excellent model system for this purpose, as it has several publicly available sequenced genomes, has a rapid seed-to-seed generation time, and is highly transformable. Various mutagenesis platforms such as Tnt1 retrotransposons and RNAi knockdown have been used successfully in forward and reverse genetic studies to identify and functionally characterize candidate genes. The CRISPR/Cas9 reagent is the most recent mutagenesis platform and is highly effective at generating site-directed double-stranded breaks (DSB) in M. truncatula. This protocol will demonstrate the construction of reagents using two genome engineering platforms that have successfully generated mutant plants in M. truncatula, M. sativa, and soybean systems. The reagents are easy to assemble, can be quickly retrofitted to test novel regulatory sequences for improved efficiency, and can be used for more advanced genome engineering strategies such as gene insertion or gene replacement. Thanks to members of the Dan Voytas laboratory, especially Nicholas Baltes, Paul Atkins, and Tomas Čermák, for the development and optimization of these reagents. Thanks to Robert Stupar for the critical reading of the manuscript and helpful comments.